Don’t know what investment banks do? Our easy-to-understand guide simplifies this complex topic. You might recognize the names Goldman Sachs, or JPMorgan Chase, but don’t know what these investment banks actually do, or how they are different from a consumer bank. For one, investment banks don't make most of their money from charging interest on loans they issue. Instead, investment banks earn by serving as financial middlemen and advisors, responsible for managing complex financial transactions involving billions of dollars. As their name implies, investment banks largely help organizations manage their investments. This can involve anything from assisting a private company that wants to go public through an initial public offering, or IPO, to helping a city raise money with a municipal bond. Their services are aimed at institutions, not people. That means most people won't ever interact directly with an investment bank. Well, at least not for personal banking. If you have a checking account or mortgage, you've probably used a consumer bank's services. Knowing about this kind of bank's role in the finance industry can help you better understand investment banks. Paying and charging interests. The way consumer banks make money is simple. People receive a small amount of interest when they deposit money with a bank. Investment bankers then loan this money out to other customers and charge them a large amount of interest. For instance, say someone has $20,000 in a savings account paying 0.06% in monthly interest. That person would earn $12 in one month. The bank, on the other hand, could use half of that $20,000 to make a $10,000 car loan that charges 12% interest per month, earning the bank $1,200 every month. Overall, that means the bank earns a net total of $1,188 in one month off of the original $20,000 deposit. The line between investment banks and commercial banks used to be firmly defined. However, this separation isn't as distinct as it once was in the past. Following the Great Depression, the Banking Act of 1933 prevented financial institutions from offering investment and consumer banking services under one roof. This was done to cut down on the risk of a bank losing its consumers deposits due to poor investments. By the time the 1990s came around, much of the anger directed toward the big banks on Wall Street had since cooled down. That part of the regulation preventing investment and commercial banking to be done in one place was repealed, and banks were free to pursue both activities once again. That's why a bank like Barclays is able to offer savings accounts to average consumers while still helping corporate clients raise millions in capital. Banks that perform both investment and consumer banking services still have some limits on how they can invest their accounts due to the Volcker Rule. Passed following the financial crisis of 2008, the Volcker Rule limits banks from making certain types of high-risk investments if such investments are made for their own profit, rather than the profit of their customers. That means that you can instruct your bank to make a high-risk investment with your own money if you feel like taking a gamble. However, your bank can't make certain kinds of risky trades with its accounts just to pad its bottom line. Even if a bank offering both investment and consumer services were to fold due to mismanaging funds, that doesn't mean all the money in your checking account would necessarily disappear. That's because the Banking Act of 1933 also created the Federal Deposit Insurance Corporation, or FDIC. This organization insures each depositor for up to $250,000 per institution for checking, savings, money market accounts, and certificates of deposit. Any account with money below that amount is safe, even if your bank goes under. For instance, say you had $20,000 in checking and $100,000 in savings with an FDIC-insured bank. If that bank went under for any reason, you'd still be able to get all your money back. 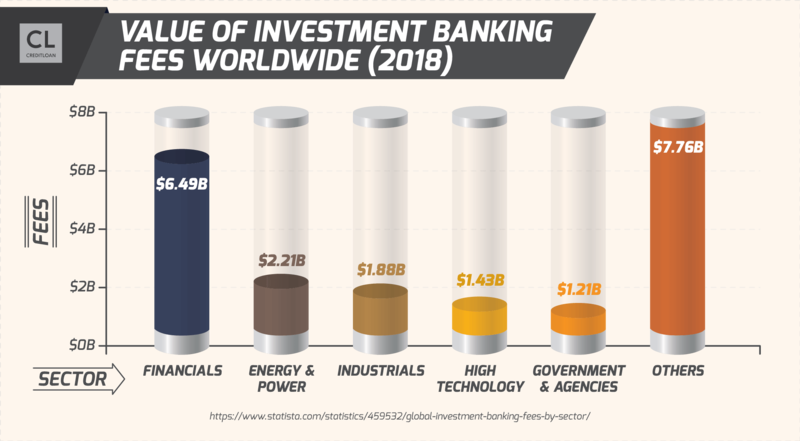 As mentioned earlier, investment banks are mainly financial middlemen and advisors for companies, governments, and other organizations. Their services can be broken down into a few areas. Companies that want a lot of money fast might issue an IPO if they think it will help them grow and expand. Investment banks can help these companies decide whether the time and conditions are right for them to become publicly traded on the stock exchange. One of the first steps an investment bank will take in an IPO is putting together a prospectus. This is a document that lists information including what a company does, how many shares will be offered, and any risks involved with investing in the company. The Securities Exchange Commission, or SEC, requires a prospectus to exhibit a high degree of depth, which is why companies seek out help from investment banks. Banks also determine how much each share will cost and then underwrite the deal. Here's an illustration of what that might look like. After examining a company's financial information and the market, the bank decides on a certain amount of money that people would likely be willing to pay per share. The bank will buy a set amount of stock at that price and then turn around and sell it on the stock exchange. For instance, say an investment bank helping take Company X public decides the shares could sell for $15 each. It buys 100,000 shares at $14 per share, then sells them on the stock exchange for $15. If all goes well, Company X would raise $1.4 million, while the bank would net $100,000 from the deal. However, say the bank overestimated how much the public was interested in the company's offering, and the shares dropped in price to $13 each, the bank would lose $100,000 instead. Another option for organizations looking to grow quickly is to buy, or be bought by, another company. For large deals, many companies will seek to partner with an investment bank. Especially one that specializes in their industry type. The first step in helping a company with a merger or acquisition is for an investment bank to do a deep dive into that company's financial information. This will help it determine how much a company is worth and which organizations the bank should approach about the deal. Most companies will approach an investment bank already with a specific target in mind. This can be an organization they hope to purchase or be bought by. The investment bank will then approach that company, lay out their client's offer, and help broker the transaction. If the purchasing company needs some assistance coming up with the funds to buy their target, the bank may help the buyer generate the necessary cash by issuing bonds. Unlike consumer banks that loan money directly to customers, investment banks usually take on a middleman role when it comes to helping their clients borrow cash. This is done through the issuance bonds. In a nutshell, bonds are a type of debt that is bought and sold. The process for issuing bonds is similar to helping a company with an IPO. An investment bank will do its research, file a prospectus with the SEC, then sell the bonds on the relevant financial markets. Unlike stocks, bonds don't grant the buyer an ownership stake in the company. Instead, the buyer will own part of the total debt. The owner gets paid when the bond comes due, or matures, at a predefined time. Both issuing bonds and IPOs require an investment bank to file a prospectus with the SEC. For a faster route to raising money, investment banks can turn to private placements. Private placements occur when banks issue bonds to specific investors, rather than to the public. This could include other banks, insurance companies, or retirement funds. The SEC believes that these institutional investors generally know what they're doing, better than most people, in fact. As a result, they place fewer rules and regulations on private placements, which makes them a faster way of raising money. As mentioned earlier, investment banks don't cater to the individual, except in special cases. Those special cases occur when the individual in question is exceptionally rich. Wealth management and Private banking. If you've got the money, investment banks will gladly help you manage your wealth and finances. This could include helping reduce your tax burden, providing investment advice and opportunities, and generally putting your money to work for you. However, some of these services are also fairly ordinary. For instance, private banking institutions can offer checking and savings accounts, albeit with slightly higher interest rates and employees dedicated to servicing their account. It takes lots of money. Investment banks have a high bar for the amount of money it takes to be considered a high-net-worth individual. Goldman Sachs requires its clients to have $10 million in investable assets in order to become a customer of its private banking services. Similarly, JPMorgan also requires $10 million for its services in this area as well. Investment banks are involved in bigger deals and therefore take on bigger risks. After all, a financial institution underwriting a $5 billion-dollar IPO is going to be taking on a larger risk than a credit union that's only issuing auto and home loans. 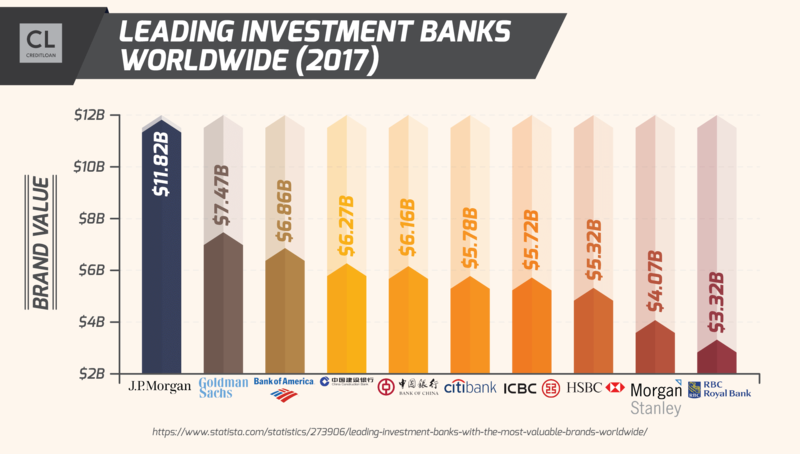 As a result, investment banks have helped companies like Facebook, Google, and Tesla raise the money they needed to provide world-changing services. However, seeing the way investment banks played a role in the 2008 financial crisis showed what can happen when these companies fail to provide their services responsibly. What are your thoughts on investment banks? Personally, I think investment banks are a huge help to many industries.